Much effort is put into designing dining spaces and selecting tableware at museum eateries—from what’s on the table to what’s not on the table—as well as the type of seating and arrangement. 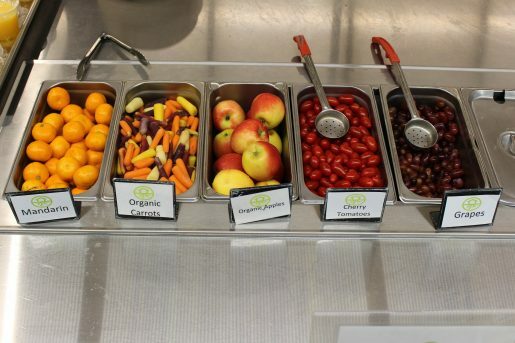 At the Rock & Roll Hall of Fame and Museum’s All Access Café in Cleveland, Ohio, Liz Carraher, event coordinator, said a mix of compostable bamboo and sugarcane service-ware that is recyclable is used. “During our busiest months, we can see upward of 4,500 visitors a day, so this allows us to offer guests a unique dining experience while still being environmentally conscious,” she said. 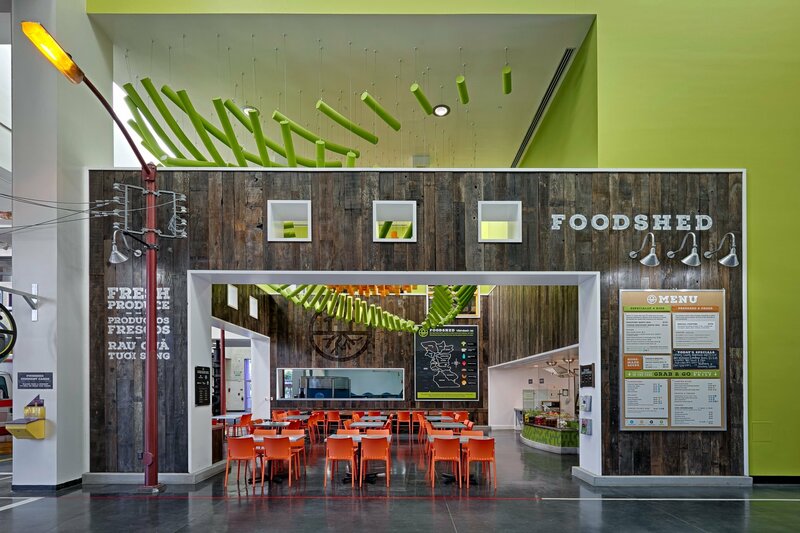 An exterior view of FoodShed at Children’s Discovery Museum of San Jose in California. Seating can accommodate large groups and families depending on its configuration at the eatery. 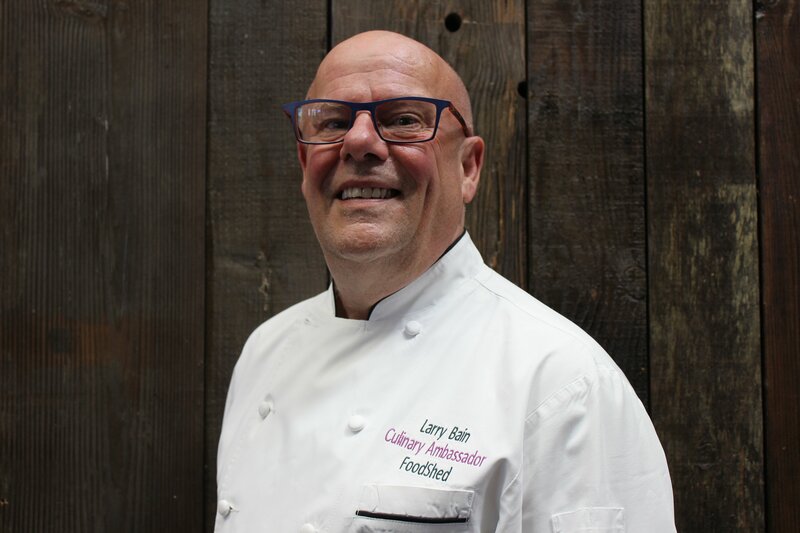 Recycling is also top of mind for Larry Bain, culinary ambassador of the FoodShed at Children’s Discovery Museum of San Jose in California. He said the restaurant uses products from World Centric, including a full line of compostable “silverware” and dishware. Plates and bowls are made with recycled paper, and coffee cups and soup bowls are recycled paper with a cornstarch lining. Cutlery and water cups consist of a cornstarch-based clear material. Laura Richmond, executive chef, Columbus Museum of Art’s Schokko Café, in Columbus, Ohio, said Steelite Craft dinnerware was selected to add a bit of warmth and creativity to the café and food. The TAM Cafe at the Tacoma Art Museum in Tacoma, Wash., has basic off-white disk-shaped ceramic plateware. 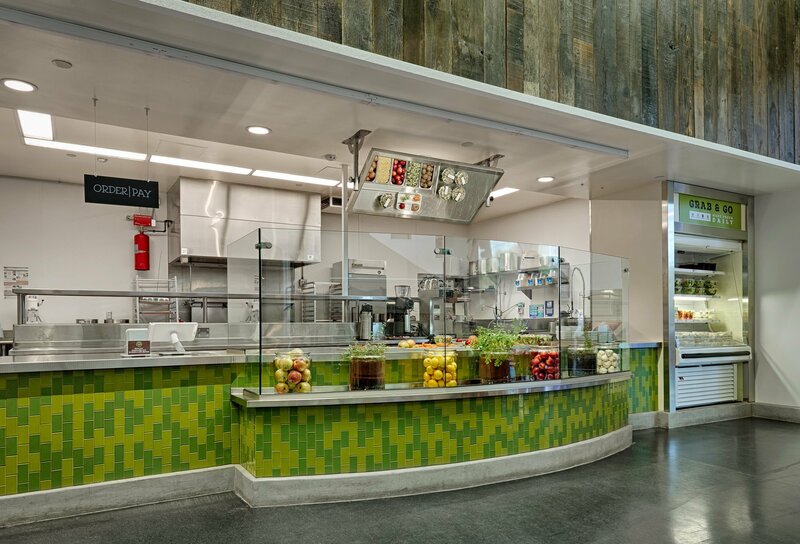 Metal silverware has a standard design so guests’ focus stays on the large pops of color from furniture and wall décor, said Tony Lang, executive chef/cafe and catering manager. Larry Bain, culinary ambassador of the FoodShed at Children’s Discovery Museum of San Jose in California. Recycling is top of mind for Bain. Carraher said communal dining tables are free of additional items, such as décor and condiments, in an effort to keep a minimalistic feel to the space with its signature rock and roll vibe. 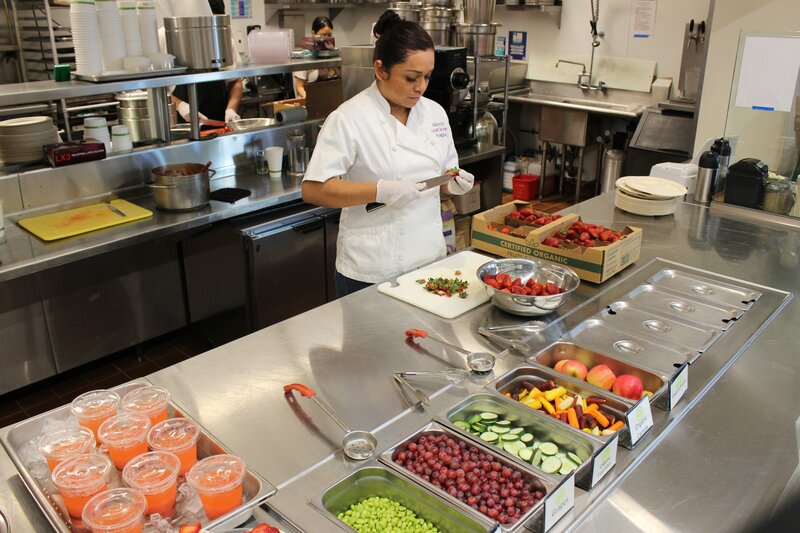 “We encourage guests to try multiple items from our menu, so we keep tables clean and open to encourage visitor groups to share,” she said. Tables aren’t set or decorated, Bain said. Zinc table tops are easy to clean; condiments, salt and pepper are at the pick-up station. The counter at FoodShed. Depending on the time of day and the weather, lighting is natural through skylights and windows, or recessed. During winter months, the TAM Café features two-foot square wooden tables accompanied by a combination of cushioned banquet seating and movable industrial rubber chairs. The space also has a bar-height communal table for 10 with bar stools. In the summer months, the outside patio extension highlights outdoor two and five-foot square/rectangular metal tables with plastic outdoor chairs. Because the heat tends to bake metal tabletops, umbrellas are overhead. Back in 2014, Lang said the café was renovated to maximize seating capacity and update the color scheme to match the museum’s branding. Banquet seating is the museum’s branded TAM red color, the wooden tables match the main lobby ceiling type, and the black chairs complement grey concrete floors while also tying in the communal bar table’s colorscape. Even summer outdoor seating tables and chairs mirror the exterior metal wall paneling with a pop of red from the umbrella fabric. All Access Café features a mix of communal, café and high-top tables with a rolled steel finish. “The curatorial department chose the finishes to reflect the museum’s look and feel,” Carraher said. Tables were selected to maximize seating in an area that must accommodate an ingress and egress of museum visitors, café guests and audience members when live performances on the main stage occur. Décor at the Schokko Café is midcentury modern meets rustic modern. White tables are flanked by orange and white Eames chairs, and two special rustic wood common tables are designed by Columbus furniture maker Edgework Creative. Bain said chairs are a sturdy rubber/plastic composite, and are simple and colorful. The FoodShed features perimeter seating with recycled wood benches on the outside with chairs on the inside. Tables are set in rows, making it easy to pull multiple tables together to accommodate large groups or families. For the renovation, Lang said maximizing seating capacity was a priority along with flow. A customer enters a natural line area to order at the counter, then turns the banquet corner to take a seat and exits the dining area away from the kitchen’s entry point. 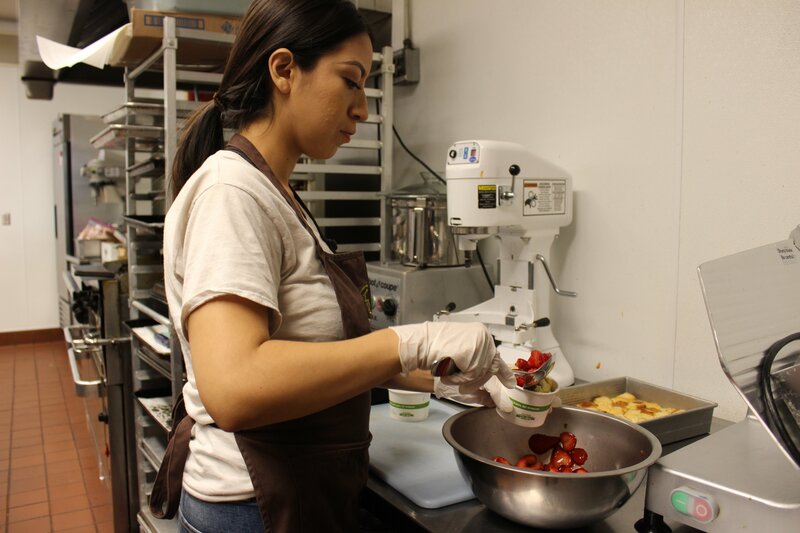 Alejandra Derramonda, assistant manager of FoodShed. 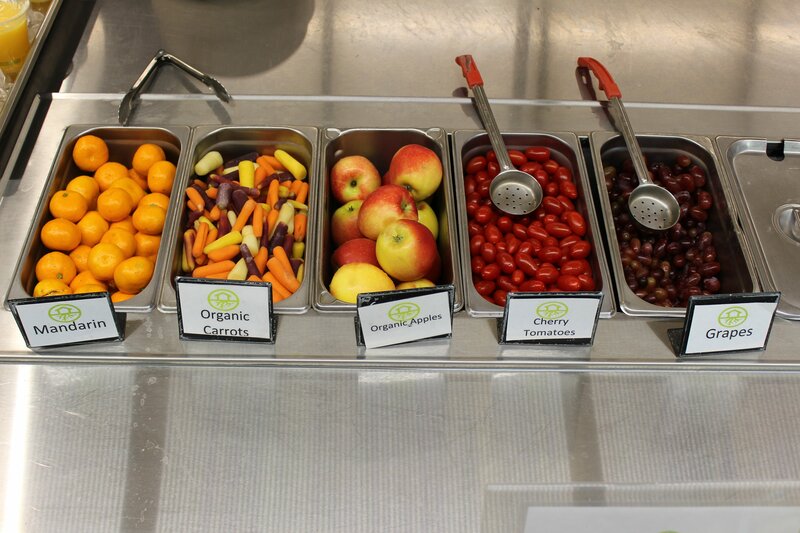 Zinc table tops are easy to clean at the restaurant and there is a pick-up station for salt, pepper and condiments. The museum consistently sees a variety of combination group sizes from families of three coming in during free Thursday Neighborhood Nights to 10 people for a business meeting on a Tuesday during standard lunch time. “Dining room tables are arranged to be as flexible as possible to accommodate customers’ different needs,” Lang said. Lighting plays a huge part in a museum, with public spaces being no exception. A floor to ceiling window wall at the TAM Café allows natural sunlight to cascade in. When it rains, a hypnotizing waterfall design comes to life. There are also pin lights over individual wooden tables and added track lighting elements to flood the area. The Rock & Roll Hall of Fame and Museum is constructed to beautifully allow natural light into its public spaces through a multistory all-glass front. The All Access Café carries on with this theme while providing stunning views of Cleveland’s skyline. At night, there’s a palette of overhead colored lighting options to invoke a club or concert setting feel. Fruit on display at FoodShed. The eatery is open from 10 a.m. to 4 p.m. and also hosts evening events. At the Schokko Café, natural lighting plays a major role in the café with one entire wall of windows and Nano doors looking out onto the Patricia M. Jurgensen Sculpture Garden. The FoodShed is open from 10 a.m. to 4 p.m. For most of the year, sunlight streams in through windows and skylights. Recessed lighting is used on gloomy days and for evening events. 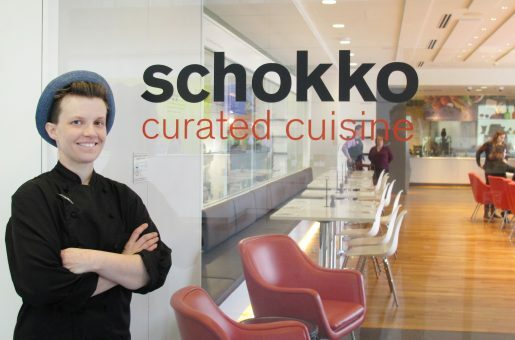 Schokko Cafe’s Executive Chef Laura Richmond. The cafe is located in the Columbus Museum of Art in Ohio. Steelite Craft dinnerware is used at the eatery.